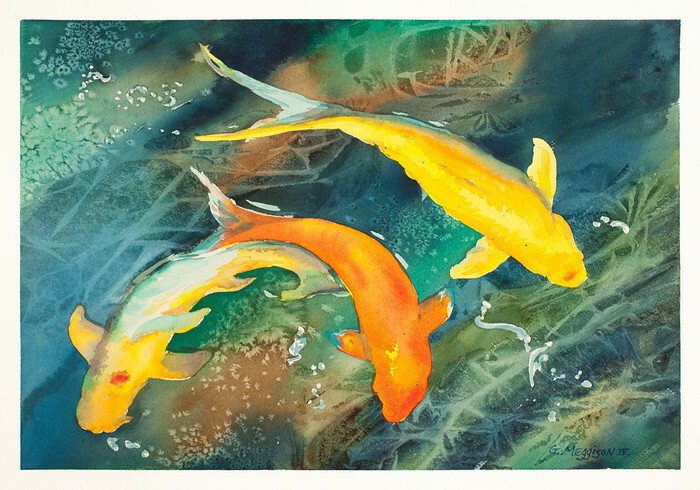 Sakura Koi 2 is a contemporary 20"x14" Watercolor on 140 lb. Arches Cold Press Paper. (See the "Wall Preview" option below to select your room type, size preference and wall color to get a better view relative to the art). Sakura Koi 2 is one of several koi watercolors for my class demonstrations, from koi at our favorite Japanese Sakura restaurant. ( See the "Wall Preview" option below the print size tab, then explore your designer wall color with the art). Sakura Koi 2 is a contemporary 20" X 14" watercolor on 140 lb. Arches Cold Press Paper. (I recommend printing on Fine Art Paper. See the "Wall Preview" option below the print size tab, then explore your designer wall color with the art). Sakura Koi 2 is one of several koi watercolors for my class demonstrations, from koi at our favorite Japanese Sakura restaurant. (I recommend printing on Fine Art Paper. For Art in situ, see the "Wall Preview" option below the print size tab, then explore your designer wall color with the art).